Accessing with a mobile? Go to the mobile site. 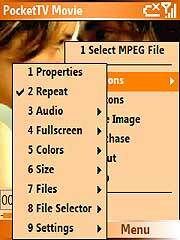 Free tools & guides to make your own MPEG's! 20% OFF On *all* mobile games and applications on MobiHand (Palm, Windows Mobile, Symbian and Blackberry). Use Promotion code POCKETTV. 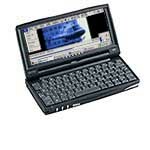 This version is only for all Pocket PC 2002 and 2000 (ARM, MIPS and SH3). Installing with EXE: Just run the PocketTV Setup file on your desktop PC while your phone is connected and sync'ed. from PocketTV.com - FREE for personal use! Just run the PocketTV Setup file on your desktop PC. It will install PocketTV automatically and effortlessly on your Casio Pocket Manager. Enterprise & professional users must purchase. The free trial period is 7 days. Purchase now! Processors supported: ARM, MIPS, SH3, SH4 and x86/Transmeta. 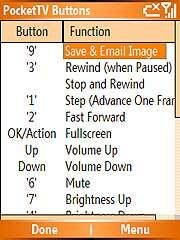 Just run the PocketTV Setup file on your desktop PC. It will install PocketTV automatically and effortlessly on your Handheld PC. If you have a H/PC 2000 device, The free trial period is 7 days. Purchase now! If you have an H/PC running WinCE 2.11, PocketTV is FREE for personal use. The downloaded file should be named something like PocketTVSetup-PPC-WinCE211.exe. If not, rename the file to PocketTVSetup-PPC-WinCE211.exe (this problem can happen with some versions of Internet Explorer). 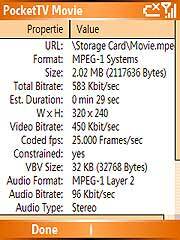 Just run this Setup file on your desktop PC. It will install PocketTV automatically and effortlessly on your Palm-size PC. SH3 H/PC 2.0 Not available, sorry! To determine the processor type and WinCE Version: depending on the version of Windows CE, select Start, Settings, System, or Start, System. Then select General, Device or About. First make sure that your device is connected to your PC. Open My Computer, then Mobile Devices, and check that you can see your WinCE device in there. Open your WinCE device from there, then locate and open its Windows folder. Then locate its Start Menu folder (in Windows). To install just copy the file PocketTV.exe in the Start Menu folder of your WinCE device ("\Windows\Start Menu\"). To copy the PocketTV.exe file, drag it and drop it on the Start Menu folder (of your device). To un-install just delete the file PocketTV.exe from the folder "\Windows\Start Menu\" of your WinCE device.